Using FXMLLoader in OSGi is not completely trivial. This article explains, how to do it. The osgisnippets project contains a project bundle_set5fxml, which is used for that. In osgisnippets and its guitool application, the classes of the OSGi framework (Apache Felix) are loaded by the system class loader. The felix jar is in the classpath of the guitool application. The BundleActivator interface is part of the felix jar and its class loader is the system class loader. 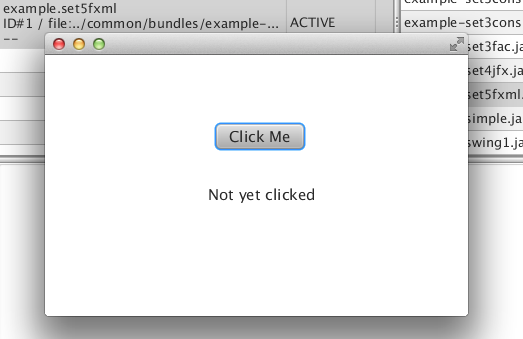 However, the system class loader doesn't know about the bundles and it can't find the ClickmeController class. To summarize: Make sure, the class loader passed into FXMLLoader.setDefaultClassLoader() is actually a bundle class loader. JDK8: Unable to Resolve javax.swing ?